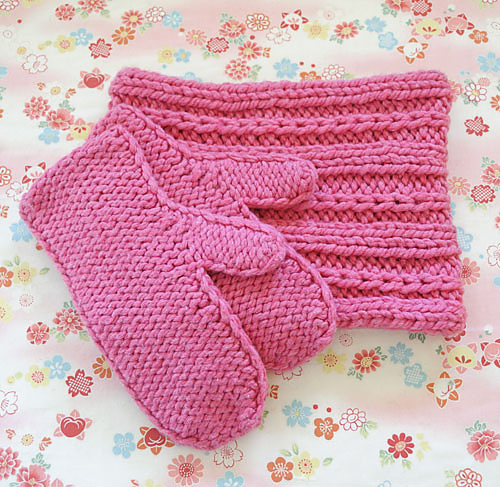 Well it’s down to the wire if you were hoping to whip up a knitted Valentines treat for someone, but here is a quick knit that can still be pulled off in time! The Dogwood Set by Jane Richmond is a lovely free pattern using Spud and Chloe Outer, a nice thick yarn, perfect for the frosty weather we have been having. I am loving the look of reverse stockinette lately (that’s when the ‘smooth’ stockinette part is on the inside) and these mittens have just the look I like. 3 hanks will make mittens and the matching cowl, the perfect gift for that special someone. This entry was posted on Sunday, February 10th, 2013 at 6:24 pm	and is filed under Uncategorized. You can follow any responses to this entry through the RSS 2.0 feed. Both comments and pings are currently closed.